Harris Corporation has introduced the new F7030 clip-on night vision weapon sight - one of the most sensitive and advanced night vision scopes available for military use today. Developed with long-time partner Knight’s Armament Company (KAC), the F7030 builds on technology used in the widely-fielded KAC AN/PVS-30 night vision sight and includes the latest advancement in night vision image intensification. It can be mounted on standard assault and long-range rifles with day scopes. The KAC-patented technology and extended focus ensures the accuracy of the day scope boresight. 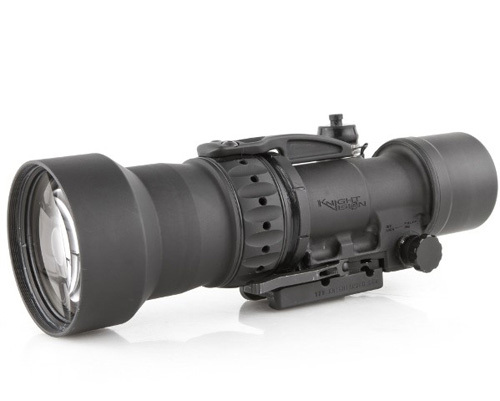 The refractive lens provides high-performance light collection in a lightweight design, and is optimized for use with green or white phosphor image intensifiers. The sight also features the patented Single Interchangeable Battery (SIB) ® that exceeds 24 hours of continuous operation. The highly-efficient power circuit can even run on used batteries providing several additional hours of operation. “This partnership brings together more than 100 collective years of experience between Harris in image intensification/night vision and KAC in weapon sights, allowing us to provide a solution that no one else can,” said Erik Fox, President, Harris night vision business. Harris Corporation is a leading technology innovator, solving customers’ toughest mission-critical challenges by providing solutions that connect, inform and protect. The company is organized into three business segments: Communication Systems, Electronic Systems and Space and Intelligence Systems.